The last of the three friendship themed blocks, is the one whose name I can understand best. One can see four squares in four different colours/prints that are combined by a strand of common colour. That’s what friendship is for me. Share something you have in common, let the rest be as it may, let it rest untouched, undiscussed. This block is a very nice picture for friendship, indeed. Posted in Uncategorized and tagged farmer's wife, farmer’s wife quilt, friendship, friendship block, quilt, quilt block. Bookmark the permalink. This block is the second in a row of three friendship blocks. I like it best of the three, though I must admit that I did not stick to the pattern to the last. 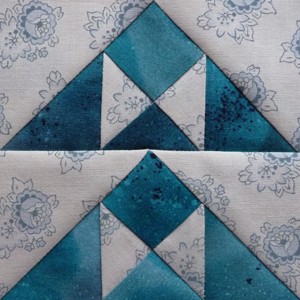 In Laurie’s example, the block features only two different prints, not three. And now that I can compare the two versions, I think the original is better, indeed. 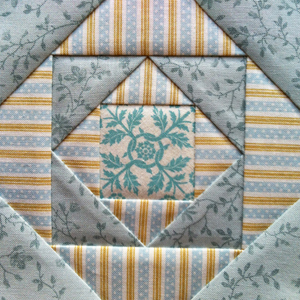 But now that I have fussy cut the centre so beautifully, I think I’ll keep the block all the same. Posted in Uncategorized and tagged farmer's wife, farmer’s wife quilt, friendship block, friendship block block, quilt, quilt block. Bookmark the permalink. The next three posts are all in the “friendship theme”. 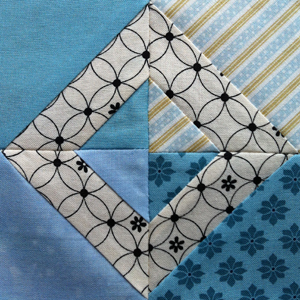 This one, Friendship Star, is a very simple block, and a very popular one too. It consists of five solid squares and four half squares. 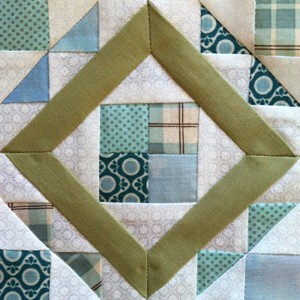 And since it is such a simple block, the focus lies on fabric choice. I could picture this block in a hundred different versions, and each would make a different statement. 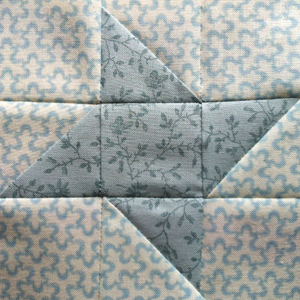 Posted in Uncategorized and tagged farmer's wife, farmer’s wife quilt, friendship star, friendship star block, quilt, quilt block. Bookmark the permalink. These blocks are almost twins. That’s why I post them together. The only difference is the bottom of the basket, and the use of different prints, of course. Laurie varied the pattern even more, though I have no clue why. As I didn’t take a short cut this time, you can even see the difference in my pictures: In Grape Basket, there are two white print triangles adjacent to each other. One could have spared a seam and cut a bigger triangle instead—which Laurie actually did in Fruit Basket, at the very same spot. Stunning, how different these two blocks look. Posted in Uncategorized and tagged farmer's wife, farmer’s wife quilt, fruit basket, fruit basket block, grape basket, grape basket block, quilt, quilt block. Bookmark the permalink. An extra big challenge for the weekend was just what I needed. 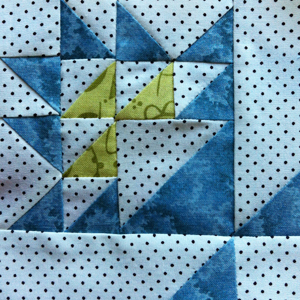 First, I was challenged to decide whether to sew this block exactly as in Laurie’s pattern or to change it a little bit and thus avoid the dreaded y-seams. After taking the decision to follow the pattern, it took me at least fifteen minutes to decide on the six prints. I wanted to have green in this block, the square ring would certainly lend itself to this role, but I did not want the ring to dominate the block. So I found me this medium green solid cotton, and I think it works nicely. 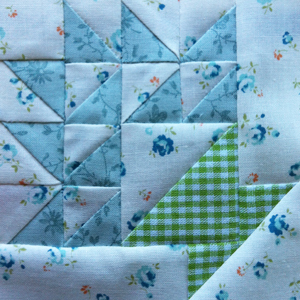 I paper-pieced the corner pieces, and “normally” pieced the centre. Then came the last four seams—I remember too well my problems with the setin seams when sewing homemaker lately—and I did them first time every time! Now I’ve earned me an ice cream, I dare say. 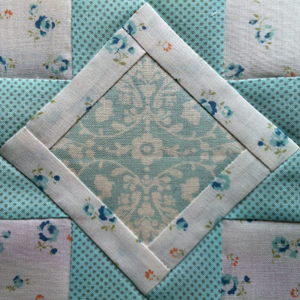 Posted in Uncategorized and tagged farmer's wife, farmer’s wife quilt, garden path, garden path block, quilt, quilt block. Bookmark the permalink. A block where no creative energy is needed to understand the pattern’s name. You look at it, and you understand it. I like that. Posted in Uncategorized and tagged farmer's wife, farmer’s wife quilt, hill and valley, hill and valley block, quilt, quilt block. Bookmark the permalink.